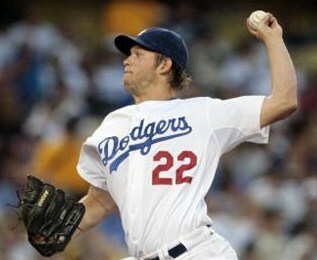 The Arizona Diamondbacks beat the Los Angeles Dodgers two games out of three at Dodger Stadium. The Diamondbacks have not lost a series since they played the Braves in Atlanta August 19-21. With the Diamondbacks overall record at 87-63, they are seven games ahead of the San Francisco Giants and tied with the Milwaukee Brewers for the second-best record in the National League. Although the Dodgers have been eliminated from the playoffs, the series against the Diamondbacks was very heated. As it has happened often this season, the Diamondbacks found themselves trailing in game one early on. Matt Kemp homered in the first inning, giving the Dodgers a 1-0 lead, which remained until the sixth inning. In the sixth, the Diamondbacks exploded for five runs off of four singles, a double, and two walks. That was more than enough to hold off the Dodgers, as the Diamondbacks won game one of the series 7-2. Joe Saunders won his eleventh game of the season, pitching seven innings and allowing only two runs. Closer J.J. Putz earned his 39th win by getting Dee Gordon to ground out to Aaron Hill to end the game. Gerardo Parra was 2 for 3 with a single, double, and a walk. He hit all four RBI’s with two outs, and almost single-handily won game one. Miguel Montero homered after Gerardo Parra singled in the first inning, giving the Diamondbacks a 2-0 lead early in game two. The lead was short-lived. By the end of the first inning, with Ian Kennedy going for his 20th win, the Diamondbacks found themselves down 4-2. After a double by Aaron Hill and a single by Justin Upton, Miguel Montero hit a sacrifice fly to pull the Diamondbacks to within one at 4-3 in the third inning. In the seventh inning things got very interesting. With two outs, Gerardo Parra squared to bunt and saw Dodgers reliever Hong-Chih Kuo throw a pitch up and in, directed towards his head. Parra didn’t appreciate that, and retaliated by hitting a solo home run to right center that tied the score. He stood and admired his blast from home plate. Many of the Dodgers took exception to that, yelling at Parra from the dugout. Catcher A.J. Ellis had words for Parra after he crossed home plate, and Clayton Kershaw, who was not pitching that night said something like, we’ll see about that. The game eventually headed into extra innings, as the Diamondbacks pitchers did not allow another run after the first inning. Gerardo Parra led off the top of the tenth with a single off Javy Guerra. After getting the next two outs, Guerra proceeded to walk three batters in a row, scoring Parra. 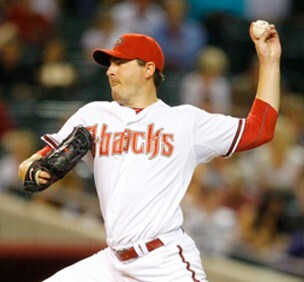 J.J. Putz closed out the tenth inning, giving the Diamondbacks the 5-4 victory, and their Major League leading 44th come-from-behind win. 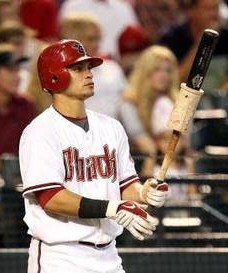 Parra was on fire, going 5 for 8 with a single, double, home run, and 5 RBI’s in the first two games. He also had scored three runs against the Dodgers. How ironic was it that the starting pitcher for the Dodgers in game three would be Clayton Kershaw, who was so upset with Parra’s actions after his home run the night before. Emotions were running high after last night’s game, and the Dodgers once again got an early lead by scoring two runs in the first inning off of four singles and a walk. Going into the sixth inning, Clayton Kershaw was pitching a shutout game, and had only allowed a double by Gerardo Parra in the third inning. Leading off the sixth inning Parra was hit by Kershaw in the right elbow, and the National League Cy Young candidate was immediately ejected from the game. It was believed by the umpiring staff that this was retaliation over the events from the night before. Both teams were warned about this before the game started. Dodgers manager Don Mattingly was also ejected for arguing on Kershaw’s behalf. Even though Kershaw was ejected to start the sixth inning, the Diamondbacks could only produce two runs the remainder of the game. Diamondbacks starter Daniel Hudson pitched seven innings and did not give up another run after giving up two in the first. Reliever Ryan Cook came in to pitch the eighth inning. He walked two Dodgers which allowed a single by Aaron Miles to score the game winning run by Matt Kemp, as the Dodgers took game three 3-2. This was only the Diamondbacks fourth loss in their last 22 games. They travel back to San Diego for a three game series against the Padres starting tonight. They have beaten the Padres in eight of their last ten matchups. The Diamondbacks will face the Dodgers at home in the last series of the season. Watch for sparks to fly in those games. ~ by Troy Erickson Realtor on September 16, 2011.